Beautiful! You have gift. Your embellishment placing is always gorgeous. Heading over right now, my friend ... :). Charming is exactly the right word, and I've always been interested in your process so I'm off right now to check it out! That was a lovely article, so perfectly you! That is a lovely article Sian, as Sue said, so you. I chuckled when I realized that this post was about tiny details--the first thing I noticed in the collage is the number 13. That's my favorite number and is, perhaps, a topic for a storytelling Sunday post. We'll see! That's one of the things I always love about your pages---your attention to detail and use of embellishments. They make for such interesting pages. What a great article and I love how you explain your attention to details. 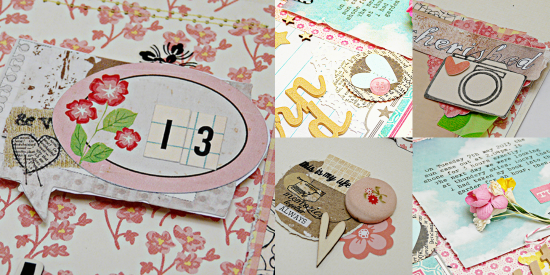 A bit of a glimpse into your scrapbooking thoughts.